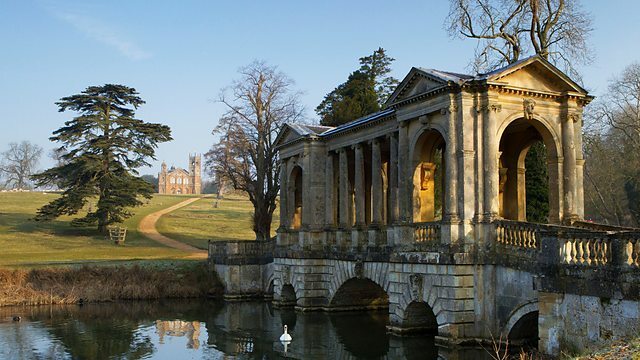 Stowe is a garden to make you hate gardens. It is, in fact, everything that is wrong with the gardens of the 18th Century. It is is not alone in this, but it pioneered much of the wrongness. I was never going to visit it, far less write about it, but loving gardens, and programs about gardens, I was watching the BBC and there it was. The program made me angry enough to write. At length. It opens up describing Stowe looming over the village of Buckingham. It’s so vast it can feel like a small country. 250 acres. The tree expert, who alone of everyone on this series of programs I like, stands in a lovely grassy valley and describes the 24,000 tons of topsoil removed to form gardener Capability Brown’s Grecian Valley. The program argues that this garden embodies a set of political ideals, that this is a garden of ideas, the political manifesto of Lord Cobham. So on the one hand, which is plausible in some ways, they argue that it is a rejection of Versailles, and with it the absolutist tyranny of Louis XIV and the French taste. They were challenging the power of England’s monarch at the time to be sure (though not in the way that the roundheads did). These gardens are not tightly confined and controlled, but simulate a natural landscape. This is in fact, the first appearance of Bridgeman’s slightly sinuous stream — the slightly sinuous stream that departs from the rigid geometries of French fashion and was about to transform western gardens after Queen Caroline poached him to design the Serpentine in London. But really now, can we call this a relaxation of our control over nature? It is an intensely manipulated pretense at nature, it copies her lines and curves, but sweet jesus is it manicured. Small areas are left to be ‘wild’ and you can see the difference, with grasses and wildflowers (‘weeds’ as such gardeners like to call them). With bees buzzing and butterflies and perhaps some wildlife…don’t talk to me about massive lawns and the poor blokes who had to trim them before lawn mowers. Or after. Is this any kind of definition of the liberation of nature? Nature freed from the stranglehold of history? The removing of the corset? Have they never walked through meadows and fallow fields and wilderness? There’s a kind of hypocrisy here, a way of describing this land as something it is not, and I don’t think it’s just to distinguish it from what came before. They’re laying claim to a positive association with freedom and nature that it doesn’t deserve. A dangerous one, I feel, when we desperately need to find better ways to live on the earth. This luxuriously self-centered simulation is hardly it. But really I was more upset about the other kinds of politics. The statement that this house and garden sets the tone for the Whig party, becomes its intellectual beacon, its political and personal morality, because what does that actually mean? A morality that reconstructs nature at immense expense to be of a nature more to its liking. That eats up the land of neighbouring families to create an estate far larger than any family could possibly need. That is used as nothing more than a foundation for a showy display of wealth and arrogance and tastelessness by its owner, much of it in a fit of pique at his former party leader. Its haha (a cleverly concealed wall that keeps livestock and wildlife out of the manicured ‘natural’ space without causing a break in the view) is supposed to symbolise an opening up to a new world, epitomising Englishmen’s new confidence. This confidence and its connection to the brutal establishment of empire is not what writer Andrea Wulf discusses, as she walks beside the temple of the worthies and says that this is her favourite part of the garden because it shows that gardens can be more than gardens. They can be political. By political I suppose she means arenas for exercises of spleen in the petty infighting between aristocrats on the same side of larger arguments over religion and monarchical succession — and god knows where their money came from, we don’t get told. Apart from that heiress Cobham married, but who knows how many of the 24,000 tons of topsoil her dowry paid for. Back to the ‘political’ though, what happened was Lord Cobham (whig) fell out with Sir Walpole (also a whig, busy shaping the emerging role of Prime Minister and getting some flack for that). Walpole stripped Cobham of his regiment, so Cobham turned his whole massive garden into a very private political protest. For his friends and admirers. He divided it into two gardens, virtue and vice, creating a narrative as you walk through it. First the temple of ancient virtue, the Elysian fields, the Styx, and on the other side of it, the temple of British worthies: Drake, Raleigh, William III (being a whig and all), Elizabeth and etc. On the opposite side? The garden of vice. Presided over by Venus — a woman, of course. Temptress. Goddess of love. Everything here is mocking Walpole & his young mistress, murals and all. Really, it’s a monument to Walpole, he must have pleased. What could not have pleased him was the building of the ‘temple of friendship’ to be the headquarters for ‘Cobham’s Cubs’, the young and ambitious whigs who would lead the revolt against the aging Walpole. Among them William Pitt and George Granville. The house is now an elite public school (remodeled by Clough Williams-Ellis, creator of Portmeirion! The village from The Prisoner! The only fun fact in this whole damn post). At several points the camera pans across a sea of sulky white public school children, and the headmaster states that new generations are being shaped by the garden. I should have thought that was the last thing we wanted to have happen. I don’t think they will be charmed by the admittedly lovely sinuous stream, the wonderful trees, the reflections of the one plain bridge that is quite beautiful. This landscape has a beauty to it, I can’t deny it. But its long sweeps are meant to display an ostentatious power, a huge scale of mastery over land, a reclaiming of some inborn right to rule coming down from the ancient Greeks, but with none of their dangerous agonising over democracy. But I sat aghast at the size and scale of everything else, built directly on a foundation of plunder from India. Lord Curzon’s buildings and gardens don’t loom over the local village, because they obliterated it. The entire thing, people’s homes for generations, was moved a mile away, leaving only the parish church in awkward conurbation with the main building. 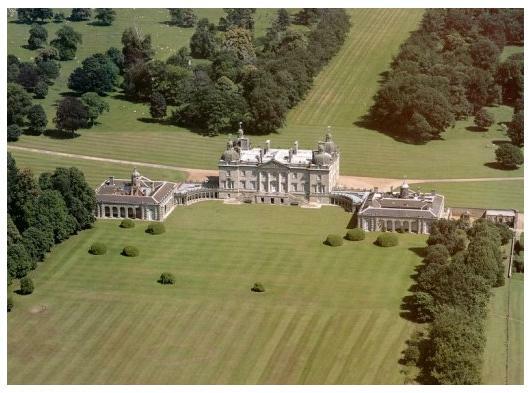 Walpole himself engaged in the battle of the gardens at Houghton Hall — and also engaged in removing the local village. They had to do something to one-up Cobham I imagine, he certainly made it difficult. These are no longer places to live in and to love, they are monuments to greed and a lust for power that was allowed to expand unchecked over people’s homes and common lands. This is true of the gardens as much as the cold marbles and imposing statues and chill echoing vastness of the buildings. The plural form of such places? A hatred of gardens.